Article and photographs by Clare Li. Falling in love these days seems to be a rare occasion. But last week, I did exactly that – with a wonderful cozy Japanese restaurant located in N.D.G. Hold on to your hats Montreal, because no one would suspect Jardin Iwaki to take the city by storm. Located on Sherbrooke with its demure signage, minimal seating inside and a cute patio outside, Jardin Iwaki is offering a thoughtful and beautifully prepared multi-course meal that begs you to yearn Japanese cuisine beyond staples such as sushi, tempura and teriyaki. Over the next hour and half, we were privy to the extraordinary Kaiseki-style offerings of Chef Tadayuki Endo. Kaiseki is a traditional, multi-course dinner attentively balancing both seasonal and local ingredients. 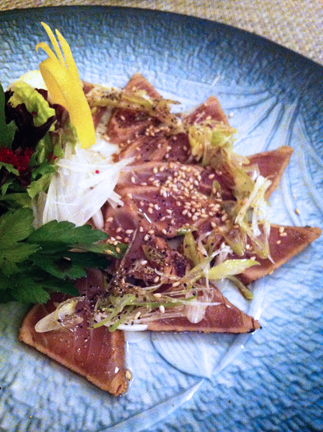 Kaiseki courses generally offer appetizers, sashimi, a soup, and dessert within the offerings. Our first course was a set of distinct amuse-bouches that worked together harmoniously. There was Tofu, Conch Shell, Chicken Liver, Octopus, Shrimp and Salmon, all fresh, and whetted our appetites for more. Our second course was a super refreshing soba noodle salad with perfectly cooked noodles, zippy vinaigrette mixed with fresh lettuce, tomatoes and tofu. The third course stole my heart (and stomach) and if I never eat anything again, I am so happy to have tried the Tuna Carpaccio at Iwaki. Our server drizzled the sauce right before serving and each bite increased my euphoric state, not to mention the presentation was very pleasing to the eye. The fourth course was a childhood favourite of mine, crisp and flavourful Okonomiyaki, miniature sized! Okonomiyaki is similar to a savoury crepe, batter is mixed with vegetables, meat or seafood then grilled and topped with bonito flakes and sauces including Japanese mayonnaise. I had asked for a substitution for the next course, chicken for pork. Picture below, juicy chicken katsu with vegetables. The next course is Zōsui – seafood with rice in broth. 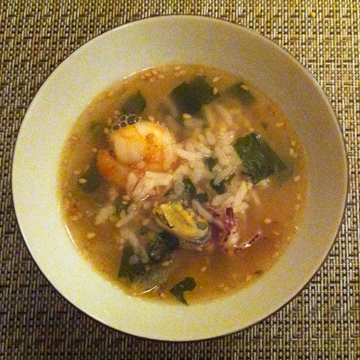 This dish was hearty, savoury and made me feel quite at home, it reminded me of a more elegant ochazuke. 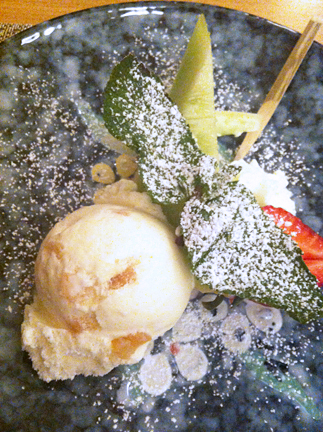 Our final course was dessert, and definitely aimed to please, fresh Ginger Ice Cream with fresh fruits. Part of me, is thrilled to share this unique culinary treasure with you, but as it is a quaint dining spot, I hope that it wouldn’t get too busy or packed in the future. 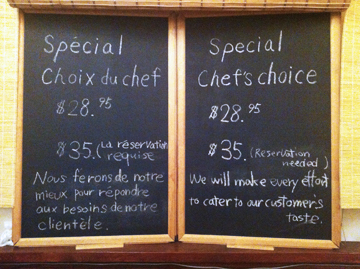 Reservations are recommended, particularly if you have any specific dietary restrictions that need to be addressed. I wholeheartedly recommend trying Jardin Iwaki, the establishment is lovely as is the staff, the food is sublime and it’s rare to be able to try a different style of Japanese cuisine in Montreal.